I know, cringe-worthy, right? For some, the thought of exercising may be extremely daunting. For others, exercise may already be part of their every day routine. The truth is, whether we like to exercise or not, it’s something our bodies (and minds) NEED, and MUST do. In order to stay strong, healthy, and “at our best”, it is vital for us as woman to take the time and energy to exercise, and invest in the longevity + quality of our lives. In the spirit of the New Year, I am so excited to share attainable tips on how to prioritize exercise as a busy woman + mom! In no way, shape, or form am I an expert when it comes to these things, but I am so confident and ecstatic to be where I am today in regards to my overall health, and want to encourage others who are "on the fence" of making a positive change in their life! This is the most important, deciding factor in efforts to prioritize exercise in your life. Post-collegiate running days, I went on an unexpected exercise hiatus. 4 years to be exact. In true transparency, I went through a stage of really hard times - stress, dramatic changes, financial troubles, weight gain, and being unhappy with my career - that really caused me to lose focus on the care + keeping of myself. So trust me, ladies - it has NOT always been sunshine + rainbows over here! Becoming a mother truly changed my view on the importance of self-care, and quickly became my “why” and motivation to prioritize exercise in my life. I now realize that I am fully responsible for the health, happiness, & well being of my son and everything that surrounds him in life. If I am not at a good place with myself mentally, emotionally, physically, and spiritually, I cannot be the best version of myself for him and my husband, and they deserve nothing less than that. Not only did this include my eating habits and making exercise a priority, but making sure I had opportunities to provide myself with the self-care I needed. I wanted to be the healthiest, happiest mom around, and make sure I am here on this God-given earth for as long as I possibly can, for my family. That was all the motivation I needed. Sit down, take some time, and think about what is really important to you. What motivates you in life? Who motivates you in life? Think about your loved ones: your children, siblings, significant other, other family members. And don’t only think about others - THINK ABOUT YOURSELF + the goals/needs/wants in your life. Moms - are you longing for “me”/”alone” time? Ladies - are you looking to get your “self-care” on, but don’t know where to start? Prioritizing exercise, no matter what your lifestyle, will do MAJOR THINGS for your confidence, attitude, and overall outlook on everything you take on in your day. It is so important to choose a workout that you will truly enjoy. Do you love being outdoors, or is a climate-controlled environment more your liking? Do you feel more comfortable in a group workout vs. solo workout? High-intensity classes like Boot Camp or lower-intensity like Barre or Pilates? Do you love lifting weights, or is cardio more your thing? Ask yourself these questions and figure out what is more up your alley! Most gyms and other exercise facilities have free, “try before you commit” classes that anyone can join in on, so take advantage of this! You are way less likely to make a routine out of/commit to something that you are not having fun doing - so take your time and decide what feels good to you. I love being outside! Although I started off slowly post-baby with walks/jogs at the running trail and Zumba classes, I gradually built myself up to Camp Gladiator - which is my current workout routine and I am absolutely obsessed with! If you’d like to learn more about my experience with CG, don’t hesitate to reach out! Whether it's to move your body three times a week, twice a week or everyday. Or maybe you want to start off slow and go for weekend workouts. Determine a realistic, attainable goal that is not “too far fetched”. As soon as I joined CG, as much as I wanted to attend 5-6 classes a week, I knew it wasn’t realistic - both time-wise and for body recovery reasons. I focused on attending 3 classes weekly, and held myself to it. Find a workout buddy or get friends/family to keep you accountable! A couple of my coworkers attend CG as well, so we keep each other in check and motivated throughout the day to make sure we get to our workouts at the end of the workday. I also remind my husband the day of my workouts, that way he asks me about how it went in the evening - that way, if I don’t go, I know I won’t hear the end of it from him! You have to intentionally make time for it in your schedule or it will likely not happen. In my overall wellness journey, I have found that planning and writing out my weekly meals & workouts has really helped me be successful. On Thursday or Friday of each week, you will find me writing in my planner for the following weeks workouts & meal plan. You are much more likely to not only remember, but hold yourself accountable/responsible for an event or goal if you write it down! Ladies, I get it. Incorporating something “new” in addition to your already busy weekly routine sounds like it’s impossible. I’ve been there, said that, and made all the excuses for it! I can 100% promise you that once you determine your “why”, making a plan and working it into your schedule is absolutely achievable. Do what you have to do to make it happen for yourself! 2 years after finally deciding to make exercise a priority & taking the steps above, I am 40 pounds lighter, so much more confident, happy, and loving my “mom bod”. I have found such liberation, confidence, and see my workouts as part of my weekly self-care, which is so important in every woman’s lifestyle. It is my outlet when things are stressful at work, at home, or when I need a mood lifter. As women, we should be so proud of the strength, endurance, and what our bodies are capable of - so we need to do what we can to take care of it! The point that I'm trying to make here is, even though you may start off very small, the important thing is that you start. It can turn into something so life-changing. So ladies, if you think it is too late to get back into working out, IT'S NOT. If you're doubting yourself & your ability to keep up in a work out class, GO ANYWAY. If you feel you are too busy or there are not enough hours in the day, I promise you that you can find a way to make it happen. There is nothing to be anxious about, intimidated by, or fearful of but the improvement of your quality of life. Find your motivation, set your goal, make a plan, and just go for it! You are worth it! 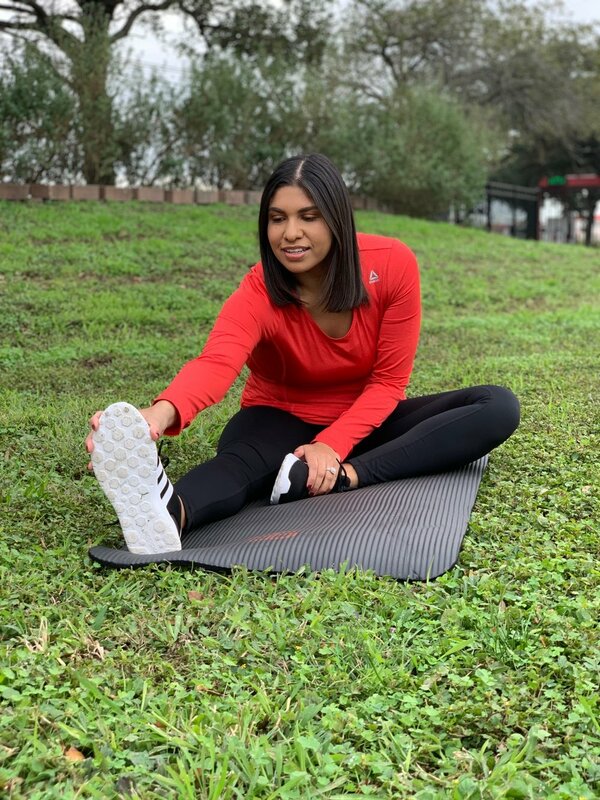 Amber Martinez Vasquez is a working mom, wife, and lifestyle blogger based out of Austin, Texas. She is a graduate of Texas Lutheran Univeristy with a Bachelor of Arts in Biology, as well as Our Lady of the Lake University with a Master of Business Administration. Amber loves working out at Camp Gladiator, spending quality time with her son, Elijah, listening to EDM, and connecting with fellow women and mothers through her lifestyle blog, The Mimosa Mom - a platform dedicated to inspiring and encouraging the everyday woman to lead an ambitious, productive, and stylish lifestyle.